At Harveys, taste is everything. Click here to play! Of course, every dish is presented in the most appetizing way possible, but rule 1 at Harveys is to create delicious dining experiences. From the creamy pumpkin soup to the escargot with just the right touch of garlic, entrees at Harveys are renowned for perfectly balanced flavors. Most guests have the lobster for their mains, and blueberry cheesecake for dessert is a must for any first time visitor to Harveys. Rule 2 at Harveys is that people love to win money. Sure, a great meal is nice and all, but it tastes even better after winning a big slots jackpot. This is why Harveys has recently added slots, poker, and a game where customers guess the color of a playing card. You may even get the chance to play against head chef Harvey himself! 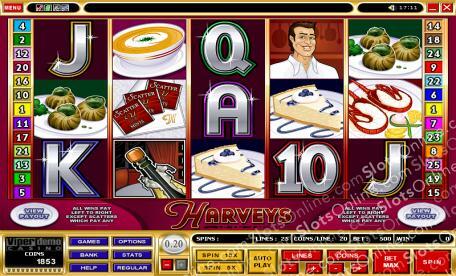 Visit the Harveys slots game today, where customers get to enjoy the finest in dining/low stakes gambling! The After Dinner Mints symbol is a scatter symbol that pays out on the total bet when enough symbols are scattered on the reels, starting with the first reel and then continuing on adjacent reels. 2 symbols payout 2 times the bet, 3 symbols pay 5 times the bet, 4 symbols payout 20 times the bet, and 5 symbols payout 100 times the total bet. The Master Chef Harvey symbol is wild, and it substitutes for any symbol other scatter and bonus symbols. When Champagne bonus symbols land on reels 2 and 4, up to 30 free spins are awarded at a 25 times multiplier. In the free spins, more free spins are awarded if the Champagne symbols appear on reels 2 and 4 again. There is also a gamble feature where players may wager on-reel wins as a stake, and then bet on the color of a playing card. A correct guess wins even money on the stake, while an incorrect guess loses the stake.